Advertising can be a huge money maker for any blog, so when it comes to selling your precious online real estate, you best do it the right way. BuySellAds.com is a marketplace that allows site owners to sell advertising directly to perspective buyers in a secure and organized way. While I still personally prefer selling ads myself, those who are new to this would greatly benefit from such a service. BuySellAds does take a 25% cut of every ad you sell, but if you sell enough, it doesn’t really matter. The site also lists important information advertisers may want to know, such as the Alex rank, Compete score, Google PageRank, Technorati links, Yahoo inbound links and number of del.icio.us bookmarks. 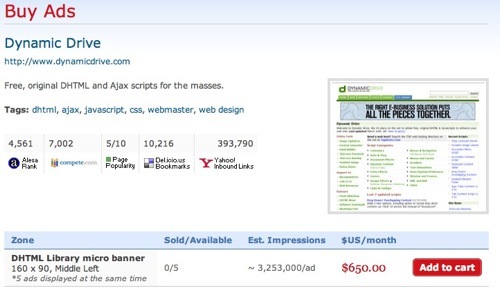 You can also choose how many ad units you want to sell on your site and in what position. If you’re getting a lot of interest, you can sell more ads than you have space for and display them in rotation. You also have the option of deciding whether an ad is nofollow or not. The site is still in its early beta stages and it appears they review each site manually before you’re accepted into the program. If you’re looking to sell advertising on your blog, but never knew how to… then I’d highly recommend using BuySellAds. I never like BuySellAds, no offense though. Few days back, I wanted to buy this ad on one blog and after seeing the link direct me to BuySellAds, I don’t feel like buying anymore. I prefer more personalize system, like buying ads directly from blogger without having to go through things like that.